Pictured above, left to right, Sisters Lucille Welbig, Mary Thomas, Vicky Larson and Janice Klein. 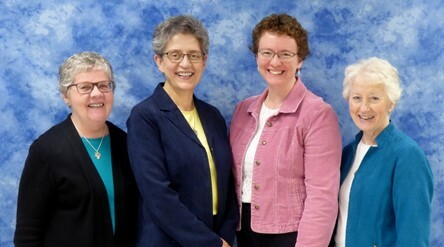 With joy in the Spirit the Aberdeen Presentation Sisters announce their president and councilors for 2018-2022: Sister Janice Klein, president; Sister Mary Thomas; Sister Lucille Welbig; Sister Vicky Larson. Please hold these sisters and the congregation in your prayers. 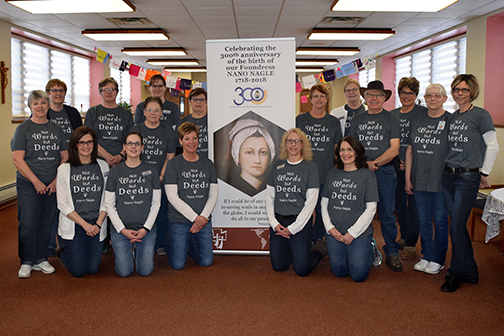 Employees of the Aberdeen Presentation Sisters show their support. Also, as we were in the midst of Chapter, many employees wore their Nano Nagle t-shirts. With solidarity, they paraded into our meeting room with joy and support for our sisters. We sang the blessing song for each other, knowing our love for Nano and our Presentation mission will be carried forward.